This pattern was suggested by my dad's cousin, Linda! She said she would love to see me do some paisley nails so I thought I'd give it a shot. I later mentioned to my 12 year old brother that I was gonna do this idea, and he told me that he had already suggested that to me before. After he said that, I realized that he was right... so this one is dedicated to both to Linda and my brother Max! These nails were not my easiest design ever! They took quite a while to finish them! I started with a base of China Glaze For Audrey. 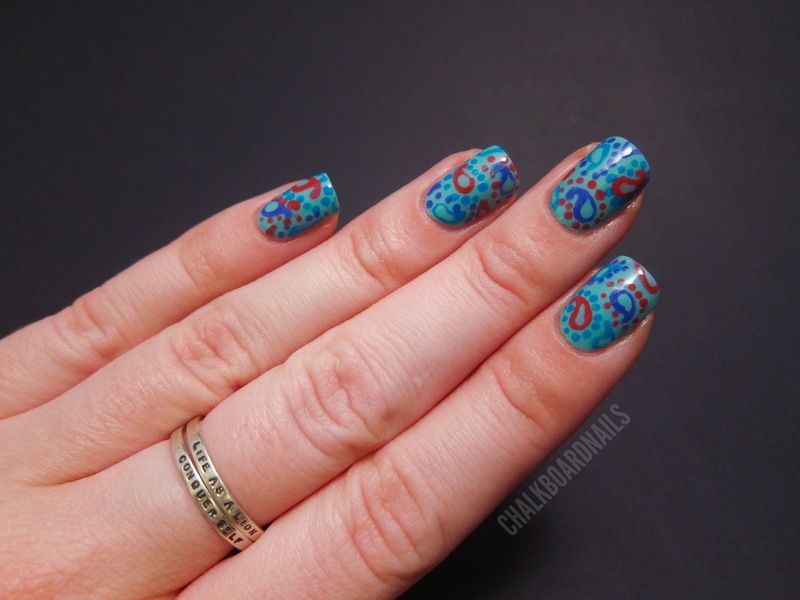 Then I added on the paisley bits in Zoya Renee (the pinkish red). I added them as solid bits first and then added more For Audrey in the center of that to give the bits a hollow look. Then I added the polka dots around the outside of the first bits of paisley in Zoya Robyn. 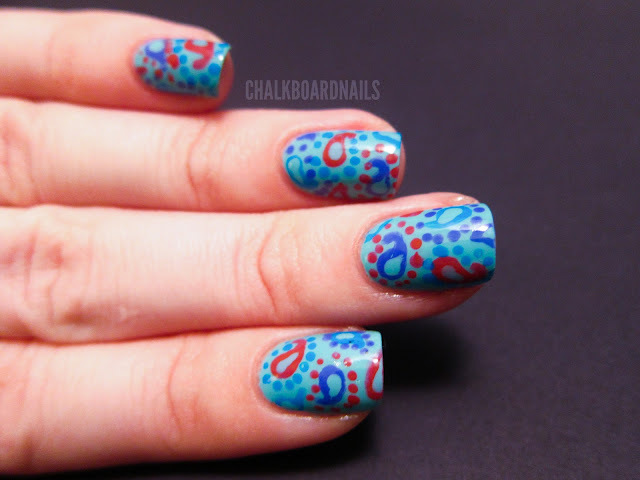 I added on more paisley shapes then in the second color, Color Club Pucci-licious. Similarly, I filled in the middles with more For Audrey, and then added the polka dots around them in Zoya Renee. As you can imagine, I then did the same with Zoya Robyn and surrounded it with Pucci-licious. This is a very busy design but it looks really nice from afar, especially. I think if I had this to do over again a second time, I would probably choose a base color that was wildly different than the colors I put on top of it. These photos aren't the most color accurate that I've ever done... my camera struggles with purples and blues so I did the best I could! But the pinkish color looks more red in these photos, and For Audrey has a touch more green than it is appearing here. I hope you like this design! I am pretty pleased with it for my first stab at this pattern! Guuuurl you have lots of patience. That makes me cringe just thinking about how long it took! It looks great though! These are really cool-would love to see it in green and brown! Nice work, Sarah! That was tough! Very cute and detailed!! Love it! 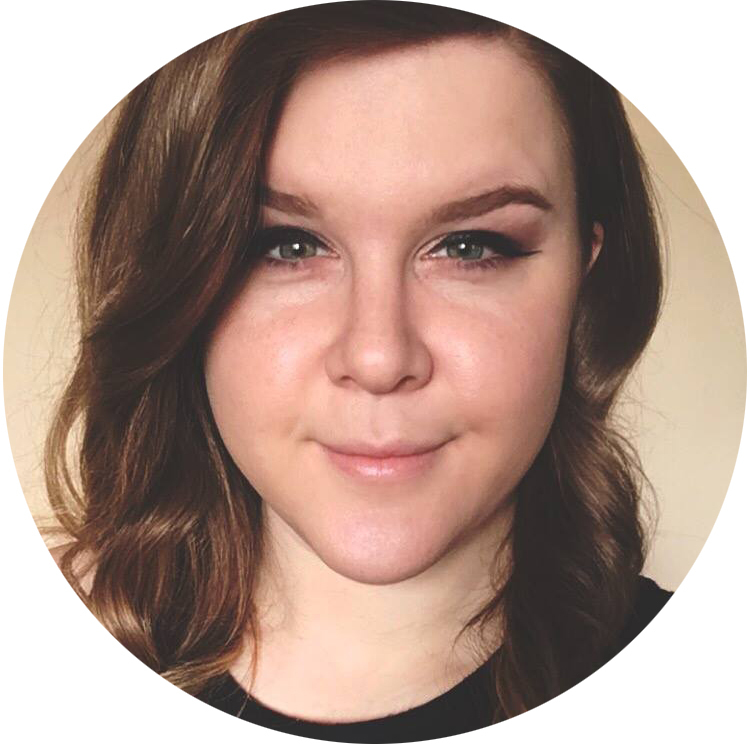 I am passing on the Versatile Blogger Award onto you!!! Check it out at allthatisgorgeous.blogspot.com! 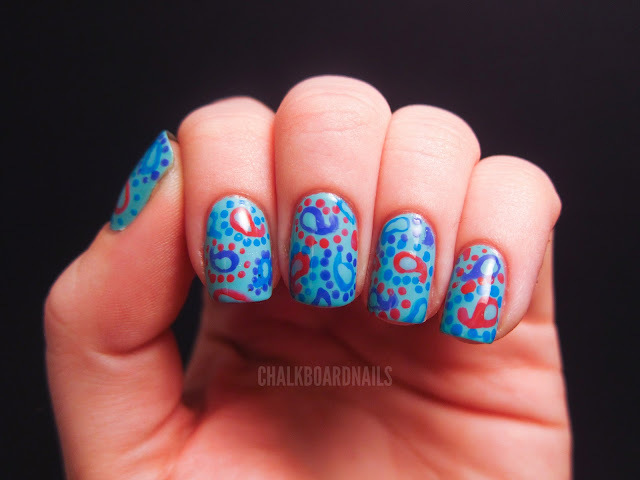 I love this nail design and colors! I also love that ring! Wow... Awesome work on nails. I like that. Thanks for sharing with us. Nice work from different colors. It's entirely different. Thanks for the useful post.